System builders listen up. If you've been eyeing AMD's 4x4 platform, the company has teamed up with Thermaltake to create two Quad FX-ready towers, the Armor Extreme Edition and the Kandalf Extreme Edition. 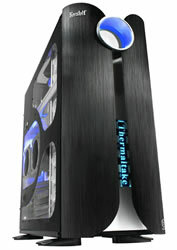 The towers use a Dual-Channel Air Guide to pump cool air from outside directly to the two CPUs inside. Both towers also come with dual 120mm and 90mm fans to keep the rest of your components cool. Pricing hasn't been set, but if you're dying to build a quad-core AMD system, these towers should guide you in the right direction.